www.postmagazine.com 18 POST JUNE 2018 SUMMER MOVIES DINOSAUR ATTACK! 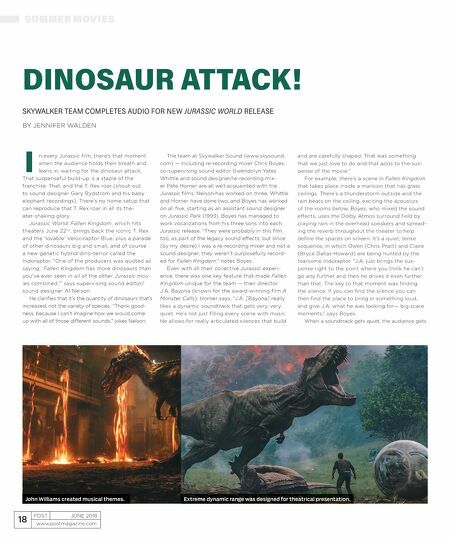 SKYWALKER TEAM COMPLETES AUDIO FOR NEW JURASSIC WORLD RELEASE BY JENNIFER WALDEN n every Jurassic film, there's that moment when the audience holds their breath and leans in, waiting for the dinosaur attack. That suspenseful build-up is a staple of the franchise. That, and the T. Rex roar (shout-out to sound designer Gary Rydstrom and his baby elephant recordings). There's no home setup that can reproduce that T. Rex roar in all its the- ater-shaking glory. Jurassic World: Fallen Kingdom, which hits theaters June 22 nd , brings back the iconic T. Rex and the 'lovable' Velociraptor Blue, plus a parade of other dinosaurs big and small, and of course a new genetic hybrid dino-terror called the Indoraptor. "One of the producers was quoted as saying, 'Fallen Kingdom has more dinosaurs than you've ever seen in all of the other Jurassic mov- ies combined,'" says supervising sound editor/ sound designer Al Nelson. He clarifies that it's the quantity of dinosaurs that's increased, not the variety of species. "Thank good- ness, because I can't imagine how we would come up with all of those different sounds," jokes Nelson. The team at Skywalker Sound (www.skysound. com) — including re-recording mixer Chris Boyes, co-supervising sound editor Gwendolyn Yates Whittle and sound designer/re-recording mix- er Pete Horner are all well acquainted with the Jurassic films. Nelson has worked on three, Whittle and Horner have done two, and Boyes has worked on all five, starting as an assistant sound designer on Jurassic Park (1993). Boyes has managed to work vocalizations from his three sons into each Jurassic release. 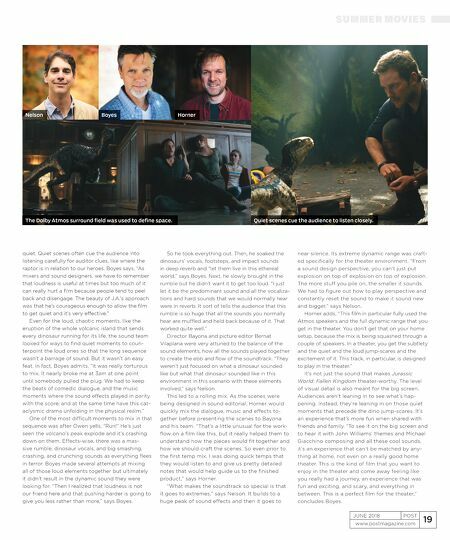 "They were probably in this film too, as part of the legacy sound effects, but since (by my desire) I was a re-recording mixer and not a sound designer, they weren't purposefully record- ed for Fallen Kingdom," notes Boyes. Even with all their collective Jurassic experi- ence, there was one key feature that made Fallen Kingdom unique for the team — their director J.A. Bayona (known for the award-winning film A Monster Calls). Horner says, "J.A. [Bayona] really likes a dynamic soundtrack that gets very, very quiet. He's not just filling every scene with music. He allows for really articulated silences that build and are carefully shaped. That was something that we just love to do and that adds to the sus- pense of the movie." For example, there's a scene in Fallen Kingdom that takes place inside a mansion that has glass ceilings. There's a thunderstorm outside and the rain beats on the ceiling, exciting the acoustics of the rooms below. Boyes, who mixed the sound effects, uses the Dolby Atmos surround field by playing rain in the overhead speakers and spread- ing the reverb throughout the theater to help define the spaces on screen. It's a quiet, tense sequence, in which Owen (Chris Pratt) and Claire (Bryce Dallas Howard) are being hunted by the fearsome Indoraptor. "J.A. just brings the sus- pense right to the point where you think he can't go any further and then he drives it even further than that. The key to that moment was finding the silence. If you can find the silence you can then find the place to bring in something loud, and give J.A. what he was looking for— big scare moments," says Boyes. When a soundtrack gets quiet, the audience gets I John Williams created musical themes. Extreme dynamic range was designed for theatrical presentation.